Warm and cheesy spinach artichoke dip is a perfect and popular appetizer for a party! It can be made in a slow cooker or in the oven and it's great either way! Who doesn't love a creamy, gooey, cheesy, warm dip? This one just begs for you to grab a pita chip and dive right in! I made it for our Easter open house and it was a hit. Our friend Sam said it was one of his top two dishes of the day. My sister Kristie was more than happy to take a container of leftovers. It was really good and super addictive! It's really easy to make, just mix together a few ingredients. 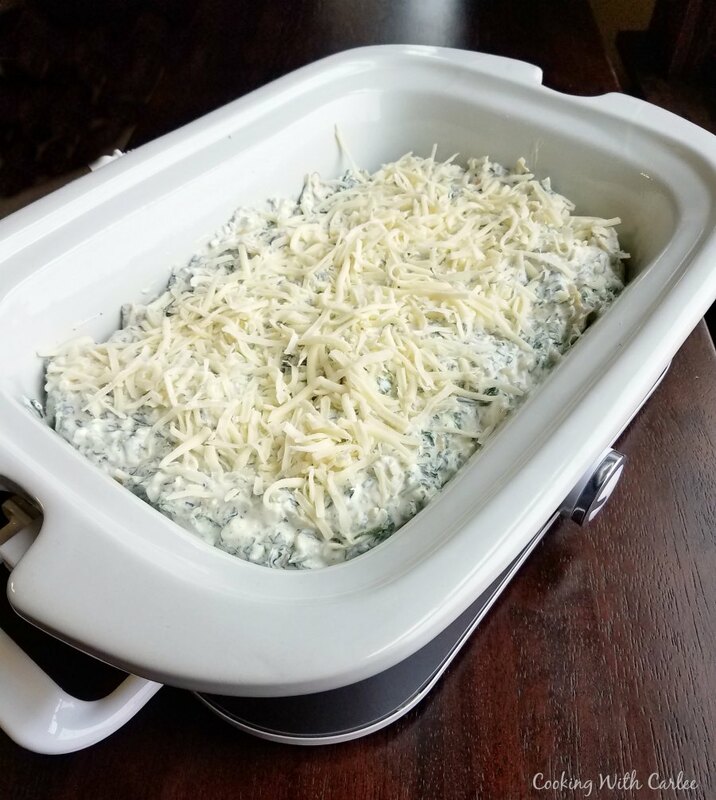 Then spread into a baking dish and cover with cheese. Or you could put it in your slow cooker and warm it that way! Stick it in the fridge until party time. Bake for 30 minutes and serve warm. This dish goes into a wire stand with tea lights underneath to help keep it warm. Though it may not have a chance to cool down anyway, it will go fast! 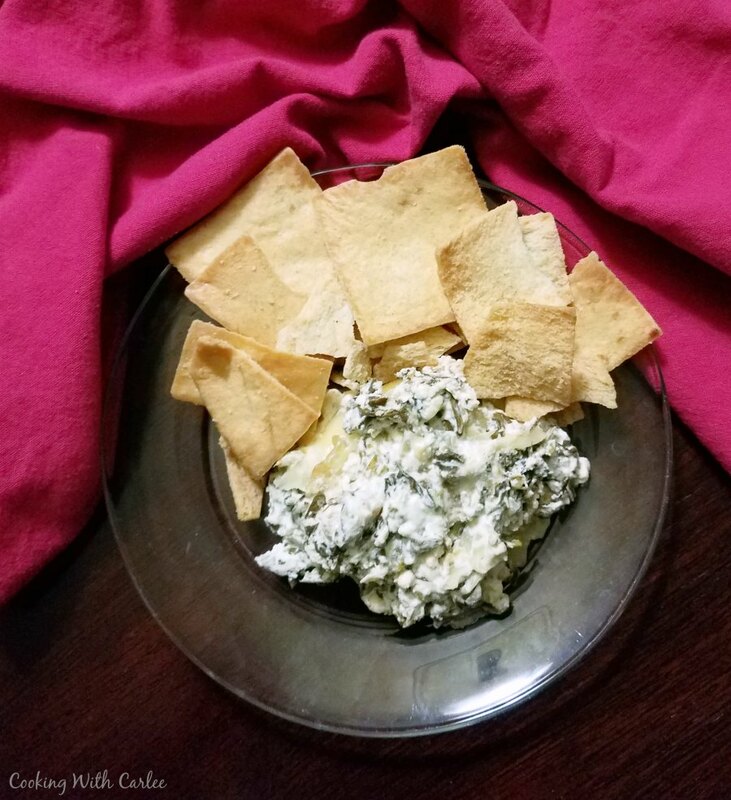 We really love to eat this dip with pita chips, but tortilla chips are a good option as well. 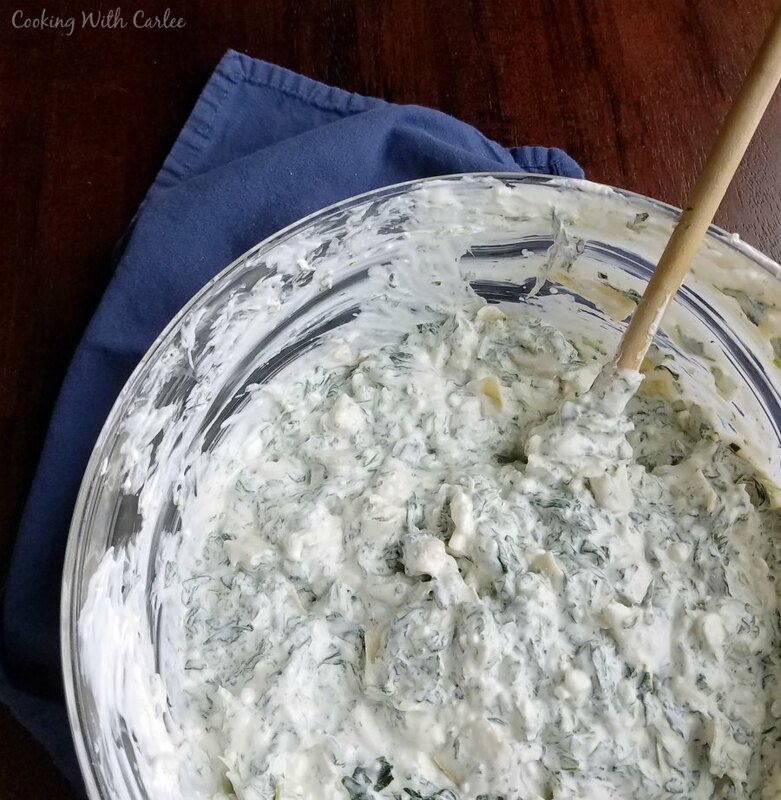 This makes a really large batch, but you can easily cut it in half for a smaller crowd. If you like warm cheesy dips, you may also like my kickin' corn dip or warm and cheesy pulled pork dip. Better yet, get a ton of chips and make them all! Make sure the spinach is well drained. Then mix together all ingredients but 1 cup of mozzarella. Once well incorporated, spread into a baking dish. Sprinkle reserved cheese over top. 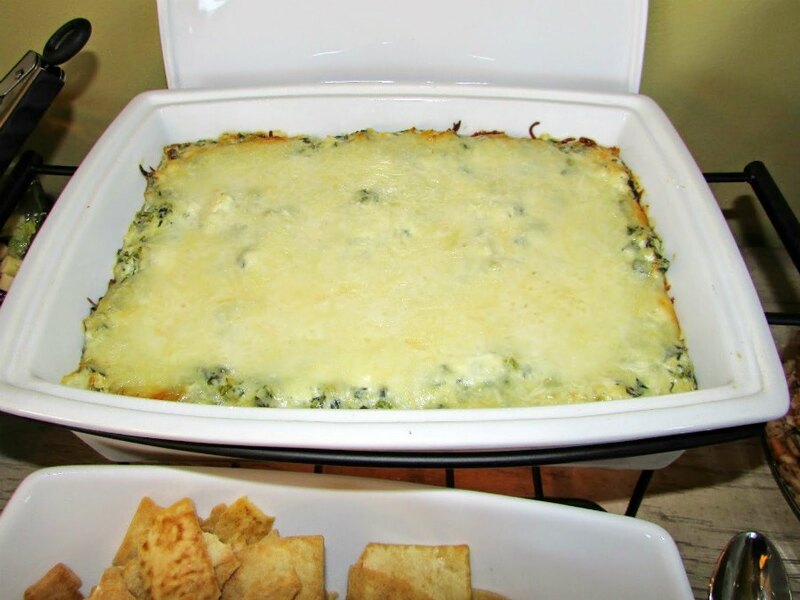 If you are making the dip ahead of time, cover and refrigerate until ready to bake. Bake at 350 F for 35-40 minutes or until starting to bubble and brown. In the slow cooker, cook on low for about 2 hours or until melty then turn to warm to serve. This looks delicious! I'm definitely going to have to try out this recipe! We loved it and hope you do too! I love this dip, but have never made it myself. Gonna give it a try! Thanks. Pinned. It is so easy to make! But it is really addictive, so make sure you have people around to help you eat it! Thanks for stopping by!